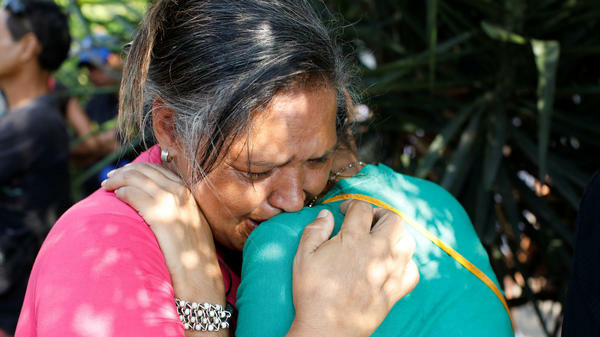 Relatives of inmates gathered outside the police station in Valencia, Venezuela, on Wednesday, hoping for information from authorities. Police fired tear gas to disperse crowds. He wrote that four prosecutors would investigate to "clarify" what happened at the police station in the city of Valencia, located in the north of the country about 100 miles west of the capital Caracas. Angry relatives of detainees gathered to face police in riot gear outside, and police fired tear gas to disperse crowds. "I don't know if my son is dead or alive!" Aida Parra told The Associated Press. "They haven't told me anything." Venezuela's prisons are notoriously overcrowded and in poor condition. Workers at the scene told The New York Times that the jail area, which is part of the police station, had a capacity for about 60 prisoners. The fire spread via mattresses in the jail, according to the AP. "Corruption, weak security, deteriorating infrastructure, overcrowding, insufficient staffing, and poorly trained guards allow armed gangs to exercise effective control over inmate populations within prisons" in the country, Human Rights Watch wrote as part of its world report for 2018. The journalism and research group InSight Crime said that as of 2015, roughly 50,000 inmates were being kept in prisons meant for only 19,000. Jail cells, meant for temporary overnight holding, packed in 33,000 people in space meant for 5,000, the group said. Cells "are so crowded that prisoners have to take turns to sleep on the floor." The organization also said Venezuela's prisons are some of the "most violent in the world," with more than 6,400 murders between 1999 and 2014. A prison fire in 1994 in Venezuela's Zulia state killed more than 100 prisoners, according to the AP.